The shock, pain and sadness of loss may be experienced after any separation. For children, this may be a move to a new area, the end of a friendship, or the loss of a pet or a loved one. For a parent, the ultimate loss is the loss of a child. There are other losses that are significant: divorce, loss of independence, and loss of dreams. Those who want to be parents but face infertility, grieve. When a child is diagnosed with a developmental dis-order such as autism or PDD-NOS, parents feel the pain of a loss for the child that could have been. It takes time to adjust expectations and embrace the life we have, rather than the life we envisioned. Autism rights activist Jim Sinclair wrote: Parents often report that learning their child is autistic was the most traumatic thing that ever happened to them. Some non-autistic people see autism as a great tragedy, and some parents experience continuing disappointment and grief at all stages of the child’s and family’s life cycle. This grief does not stem from the child’s autism in itself. It is grief over the loss of the normal child the parents had hoped and expected to have. Parents’ attitudes and expectations, and the discrepancies between what parents expect of children at a particular age and their own child’s actual development, may cause more stress and anguish than the practical complexities of life with an autistic person. As with all the information that I provide, please take that which serves you and let the rest go. Whether the loss seems big or small, honor the feelings you are experiencing. Do not feel guilty that you are grieving the fantasized normal child or your dream that your child would be playing golf or piano or talking by now. Be prepared for waves of emotion. All of your feelings will not come at once. Feel whatever you are feeling without trying to put on a happy face – or trying to do anything. Allow yourself to have your own experience. Do not judge yourself by the experiences or time-lines of others, even if they experienced a similar loss. You can laugh and go out and enjoy a meal or a movie. You can enjoy life even while grieving. You do not need to justify or explain your process. Seek and accept support that is right for you. Join a group or lean on a friend. Consider these Six Tips for Surviving the Darkest Days. The cell salts calc phos and kali phos offer gentle support for grieving mothers, fathers, and children. In the chart below, I list a few of the remedies commonly indicated for loss and grief. Taking a homeopathic remedy will not numb your feelings or make you forget the loss. The remedy will support you and assist you in processing your emotions. Grief with shock after the loss of a child, parent, friend or pet. Fighting the tears and swallowing your feelings. Feel a lump in the throat. Crazy laughter alternating with pitiful tears. First remedy to consider for recent losses. Paralysed with grief, possibly after the death of a child. Sluggish. Complete lack of energy. Old grief. Or, a new grief that awakens the unexpressed sadness from old losses. Cries easily, especially when talking about what happened. I recently came across another remedy for deep grief. “Cygnus cygnus is a powerful remedy for deep seated grief that pervades the psyche with a deep sorrow that cannot be overcome.” Read more here. Take the remedy every evening at bedtime, at least 15 minutes after eating, drinking, and brushing teeth. Continue for one week. Evaluate how you feel. If you feel better, stop taking the remedy. If symptoms resume later, take the remedy for another week. If you do not feel different, select a different remedy or consult a homeopath who can help you choose the correct remedy for you. In matters of health and healing, be fanatical about self-responsibility. Cell Salts and homeopathic remedies enable you to participate actively in your own healing. At the same time, you should continue to see your doctor and therapist for examinations, advice, and treatment. Nothing on this site is intended as a substitute for medical advice. Miranda Castro: Homeopathic Guide to Stress: Safe and Effective Natural Ways to Alleviate Physical and Emotional Stress. Because there was significant interest in my recent post, Nat Mur: A Remedy for (Almost) Everybody, I am sharing the healing stories of two clients for whom I prescribed Nat Mur. I hope that in reading these case studies, you will perceive how homeopathy facilitates healing transformation. Important: When prescribing remedies, homeopaths look for remedy that matches the individual’s picture at that time. Most homeopathic remedies have hundreds of applications. When prescribed constitutionally, remedies build health and strengthen the vital force. The individual’s vital force initiates and accelerates healing. A remedy prescribed for migraines in one person and might well be prescribed for constipation in another and eczema in yet someone else. Lena’s mother came to see me because her five year old daughter exhibited tremendous anger over small things. She was impulsive to the point of being a danger to herself. She was having a major tantrum or two every day, yelling, kicking, and hitting those around her. She ignored her caregivers, acting as if she did not hear them. Lena was having trouble falling asleep and woke screaming in the middle of the night two or three times per week – sometimes more than once per night. As you may imagine, this was exhausting and emotionally draining for her mother. She was also prone to croup, having had it at least five times in the past three winters. She craved candy, milk, and, interestingly for a small child, coffee. I directed the mother to give her daughter one dose of the remedy at bedtime. Lena was also taking cell salts that I had already prescribed during an earlier consultation. “She’s sleeping through the night and the tantrums no longer include aggressively hitting her little sister. She still whines and pushes, but it’s definitely not as combative as it was before. The tantrums seem to be shorter and less intense. They occur when she is hungry or tired. Yes, I replied. Nat mur is a great remedy for eczema in children. Matthew’s mother was concerned because her son was allergic many common allergens and had asthma. She disliked giving him asthma medications, but the episodes could be frightening for both of them. She wanted to see if homeopathy might help. We did give Matthew another dose of Nat Mur. He is doing well, again. This is the most important doctrine of homeopathy. No two human beings are exactly alike and so the medicines used for their treatment need not be alike – even if they have the same disease. Homeopathic medicines are prescribed based on the totality of symptoms of that individual. The name of the disease is not particularly important to the homeopath. If you are interested in individualized treatment just for you or your child, you can find a homeopath at the National Center for Homeopathy website. Synchronicity, ever at play in our lives, subsequently led two clients to express an interest in learning more about this remedy. Because it has so many uses, I thought more of you might be interested. The homeopathic remedy Natrum Muriaticum (Nat-m or Nat Mur) is prepared from sodium chloride or common table salt. After water, salt is the most widely distributed substance in a nature, so it is not surprising to discover that many people need it as a homeopathic remedy. Nat mur is the remedy for ailments from suppressed grief, disappointments, and haunting memories. Most of us have more than a few of these types of old hurts. When they manifest as some of the symptoms in the lists below, nat mur may be the remedy needed. No individual will have all of the symptoms or characteristics of a homeopathic remedy. Because homeopathic remedies are prescribed for individuals, not for diseases, three people prescribed the same remedy will likely have come to see their homeopath for three very different complaints. For on-going or serious issues, schedule an appointment with a homeopath who will ensure that the remedy prescribed is the correct remedy for you. Miranda Castro. Homeopathic Guide to Stress. Catherine R. Coulter. Homeopathic Sketches of Children’s Types. Lionel Rolfe & Nigey Lennon. Nature’s 12 Magic Healers: Using Homeopathic Cell Salts to Protect or Restore Health. Soon after I prepared my Homeopathy for Summer post, I was provided with two opportunities to follow my own advice. One beautiful summer day, I got to spend time with two friends and their families. As our visit was coming to an end, two little girls bumped heads. One girl cried for a minute, but quickly recovered from the unpleasant surprise. The other girl bit her tongue during the incident.We could see that her tongue was bleeding as she let out a few screams before settling into the comfort of her mother’s lap. Because the tongue was already turning purple and swelling, I administered (with her mother’s permission) a high potency of arnica (1M). She was distressed and did not want us to put the remedy in her mouth. After a few minutes, she let her mother pour the pellets into her hand and nibbled them. I share this method of administration especially for those who have heard that you can never touch homeopathic remedies because this will inactivate them. While it is standard practice to put the pellets into the cap and to tip them into the mouth, it is important to be gentle and loving in administering care. We do not want to traumatize a child (or adult) further by forcing them to put pellets in their mouth in a way that is not comfortable for them. After about ten minutes in her mother’s embrace, the tongue appeared to be back to its original size. The girl got up and resumed playing. The teeth marks were still evident. We put a few pellets of calendula 30c in her water bottle to assist with the wound healing. Another important component of this healing: From the first shriek until she returned to playing, the little girl was lovingly supported by her mother as she processed the pain and shock of the incident and released it. Later, my friends left for home and I went for a walk. It was a beautiful evening. I saw six hot-air balloons sailing over the lake. My children were running around happily. The temperature was cool and pleasant. When I returned, my daughter calmly announced, “Mama, I think my toe might be broken.” Camp was scheduled to begin in three days. I soon learned that her brother, who likes to rock on his chair, had landed the chair on her foot. Fortunately, she was wearing shoes and knows how to use basic homeopathic first aid remedies. She had already taken arnica and hypericum from my first aid kit. She had left her shoe on to protect the toe. When she removed her shoe, it was very obvious which toe was injured. The fourth toe was pink and swollen to almost double the size of its neighbors. I gave her another dose of hypericum 200c. Ten minutes later, she said her toe felt better, but she’s a good sport and the swelling looked the about same to me, so I gave her a dose of arnica 10M. Twenty minutes later, the toe had returned to its normal size. I asked her to gently bend and flex her toes. She was able to do this without pain. When I wrote this post, I had not yet read the magnificent book Verbal First Aid. Please read: When our children get hurt, the words we say can initiate healing or exacerbate the trauma. 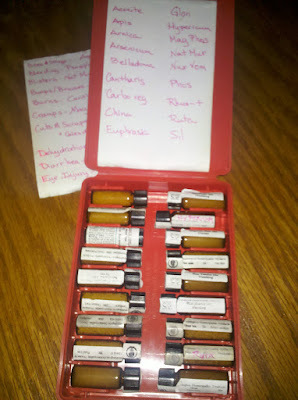 Do you need your own homeopathic remedy kit? You can purchase one from 800homeopathy or Washington Homeopathic. If those kits are too bit, consider putting together your own. Here’s what’s in mine. Homeopathic remedies are very effective and often produce amazing results. However, they do not replace professional medical care. In matters of health and healing, be fanatical about self-responsibility. Seek medical attention immediately for all serious or potentially serious injuries. In the summer, my children go away to camp. They go without me, and my homeopathic training. Because I want my children’s bodies to be supported, as they are at home, I pack homeopathic first aid kids along with sleeping bags, insect repellent, and water bottles. Homesickness and various fears and anxiety may also be alleviated with homeopathic treatment. However, these are beyond the scope of this article. Consult a homeopath. Prompt, appropriate treatment allows children to resume activities and enjoy the camp experience. *Homeopathic remedies are very effective and often result in quick healing. However, remedies do not replace professional medical care. In matters of health and healing, be fanatical about self-responsibility. If injuries do not respond to the remedy very quickly and/or seem serious, seek medical attention immediately by dialing 911, going to an emergency room, or contacting your physician. Homeopathy purists may object to this type of simplified list. They will remind us that homeopathy is about individualization and matching all of an individual’s symptoms to a whole remedy picture. They are correct. But it is possible to use homeopathic remedies in most first aid situations effectively with only basic knowledge because the acute remedy picture is usually clear. It is my hope that if you try some of these remedies and see their elegant work, you will be inspired to seek further information about homeopathy. You may become interested in trying homeopathy for conditions that require careful, professional treatment. It is much easier to be inspired to want to try homeopathy if you have seen its healing power. Homeopathic remedies act as catalysts to help the body heal itself. Remedies may be purchased at most health food stores or through websites such as 800homeopathy or at most health food stores. In all first aid situations, use common-sense and traditional first aid strategies in conjunction with homeopathic remedies. Remember too, that your loving presence is a powerful healing force. If your child is crying or shaking, allow them to release the energy this way. Support your children with loving, supportive words. “That must really hurt.” “The worst is over.” Teach children how to use words to begin healing themselves by reading Owie Cadabra. When using homeopathic remedies for first aid, improvement of symptoms should be evident within 10 minutes. If you do not see results, repeat the remedy. If the remedy helps for a while then the pain or condition returns, give another dose of the remedy. If there is no relief after three doses, try a different remedy if it is indicated. If the injury is serious or not responding to remedies, seek medical attention. Prevention is always the best cure. Teach your children the importance of good hygiene and drinking lots of water in the summer. Assist their bodies in reaching optimal health before camp by providing healthy foods and taking the Cell Salt combination Bioplasma, three times per day, for a week or two before camp starts. If your child will be in an area with a lot of poison ivy, consider giving them one dose of Rhus tox, the homeopathic remedy most often indicated for poison ivy, once per day for three days before camp. I have used this technique when my children were running around in poison ivy. None exhibited the characteristic rash. You know your child best. If your child is able to follow instructions and the camp permits it, prepare a kit with some or all of the above remedies. Teach your child how to use them. Instruct them not to share the remedies. If you child cannot self-administer remedies or the camp does not allow them to do so, consider sending a kit to be kept by the nurse with instructions to call you if a situation requiring attention arises. Was this article helpful to you? I am very grateful when my friends and readers repost on Facebook or Twitter or forward to their friends via e-mail. Just click on the appropriate icon below to do so.